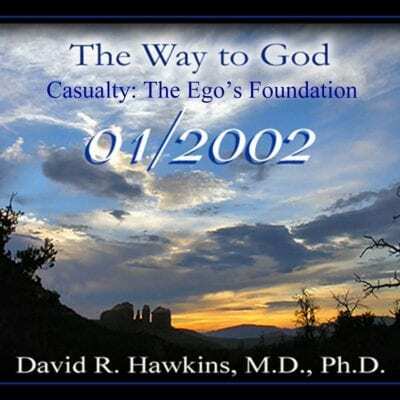 Dr. Hawkins introduces his first lecture in the Sedona Series, “Causality: The Ego’s Foundation”, with an explanation of why he wrote the book, Power vs. Force. He wanted to provide a way for people to move from the everyday linear world of black and white to the less familiar, abstract, nonlinear world without thinking they were moving into a mystical, imaginary realm. He wanted to enlarge the paradigm of reality of science so the intelligent person could comprehend the work and conclude that there was something to look at in the nonlinear domain. Dr. Hawkins talks about the shift in psychiatry in which everything has to be evidence based and how the Map of Consciousness provides that documentation, along with the response of the human being to the field of consciousness. He further explains the development of the Map of Consciousness and discusses the various levels and characteristics of human consciousness, from below 200, where everything is detrimental to life, to above 200, where that which is true, valid, pro-life, and spiritually whole contributes to life. Dr. Hawkins discusses the higher levels as well and how a true guru or teacher has to calibrate over 540, the level of Unconditional Love. He gives a brief description of what may be experienced at the levels above 540, and on up to 1,000. The world of duality is discussed and how the research seemed to bring up a polarity similar to good and evil. At first it seemed like two different worlds, but then it was found that creation is continuous and evolutionary. Also, there are no “either-or’s” but instead variations in qualities, e.g. more or less light. He further explains the Map of Consciousness and the characteristics and experiences that occur along the scale. He delves into the concepts of positionality and duality and the roles they play in our lives. He also explains how to change our perceptions. Dr. Hawkins then talks about the misunderstandings surrounding the concept of causality and the perceptual blocks they create. They prevent us from seeing what is actually going on and block our experience of the Presence of God. Spiritual awareness has to do with understanding the nature of Creation and of God. He emphasizes that it is essential for spiritual teachers to calibrate above consciousness level 200, the level of truth and courage. In the Newtonian Paradigm of reality and our society, there is a “this” causing a “that.” Consequently, becoming enlightened in this world is difficult because the mind, the ego, and feelings are barraged continuously by a paradigm of reality that is based on duality. Dr. Hawkins says that consciousness research is the only approach he knows to really investigate the reality behind the world’s teachings. He states that the purpose of the lectures is to share how we come to the knowingness of the presence of God. He talks about the nature of God in a way that is easily understood and defines the spirit, the field in which it moves, and the effect of Karma. He lets us know that life is continuous, that its source is Divinity, and provides the proof. This lecture provides the foundation for all the lectures that follow and is very helpful for understanding the advanced information. It concludes with questions from the audience being answered by Dr. Hawkins.